Brussels sprouts are incredibly versatile, and even though they look like miniature cabbages, they taste quite different. 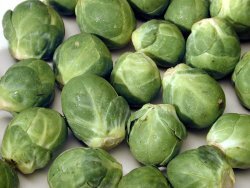 The sprouts themselves can be cooked whole as a green vegetable, added to curry and stews, or chopped for salad use. There are some interesting ideas for other things to do with your sprouts here. And in Spring, the tops of the plants can be used as Spring greens, but with a sweeter, nuttier flavour which I prefer. Choose an open, unshaded site with fertile, well-drained and moisture retentive soil, which should be slightly acid (min pH 5.4, but see note on clubroot - add lime if necessary to adjust pH). Brassicas have a high nitrogen requirement and also need very firm soil. To ensure sufficient nutrient levels, it is best to topdress or apply a liquid feed such as seaweed fertiiser during growth. Because brassicas are prone to soil infections, for example, Clubroot, it's important to use a minimum 3 year rotation plan. Sow in a seed bed unless soil is heavy, in which case use seed trays or modules to minimise root disturbance. Sow 2-2.5cm (¾-1") deep, spacing 7.5cm (3") apart in the row. Transplant at about 10cm (4") tall or when the first true leaves develop to follow legumes or onto a site which was manured the previous Autumn. On light soils, plant into drills 8cm (3") wide by 10cm (4") deep and earth the plants up as they develop until the soil is level, otherwise on the flat. Plant firmly enough that pulling on a leaf results in it tearing. Use brassica collars to prevent root fly. Transplant 60cm each way (2'x2') from mid-May to early June (earlies in spring). Closer spacing (as low as 20") induces smaller sprouts and uniform maturity. Water until established. Water after transplanting and daily in dry weather for 3-4 weeks, about ¼ pint per plant. Hoe to keep weed free. Mulch to conserve moisture and suppress weeds. Catch crops may be sown between rows early on, eg. radishes, lettuces, seedling salad crops. Water up to 4 gallons per sq yard per week in dry weather. The minimum watering requirement is a single heavy watering 10-20 days before maturity. Earth up, and stake varieties to be overwintered. Harvest from the bottom up, removing diseased or yellow leaves and blown sprouts as you go. Sprout tops are used at the end of the season. Clubroot, damping off and downy mildew are the most likely diseases. Mealy aphid may cause serious damage in late summer, penetrating and spoiling the sprouts. Keep a close watch and deal with them immediately by spraying with derris or fatty acid spray. Once infected avoid growing any brassicas except fast maturing types such as Texsel greens or cut and come again oriental seedlings. If you have no other land available, and you must grow types with a lengthy growing season, you can try sowing seed in modules, and potting up until the plants reach a height of 10cm (4") before planting out. A root drench may also help.